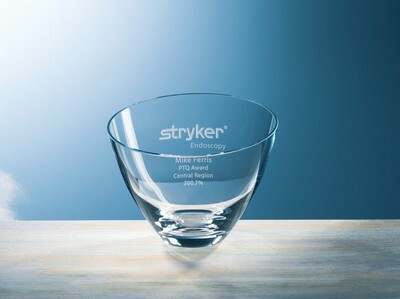 Give recognition to those that deserve it most with the Custom Etched Non-Lead Crystal Medium Orbit Bowl, imprinted with your personalized logo in one location. An innovative product from Sterling Cut Glass, Orbit Bowl Medium is a stunning piece of glassware that suits promotional purposes for its value for price! This affordable bowl is hand-blown from superior quality non-lead crystal glass and features an attractive slant back to front. It also comes with a reverse side etching feature that creates a nice show-through, magnified effect. Imagine how visible will your brand details be on this bowl with this effect! Customize the bowl by imprinting your corporate logo and marketing message and gift it to your employees or customers to impress them. They will definitely cherish it for many years to come and will love your brand.